While stand up paddle boarding (SUP) is certainly easier to learn than regular surfing, to maximize the joys of the thrilling water sport, it’s ideal to book a lesson with one of the best Maui SUP paddle board coaches in the world. And luckily for tourists vacationing on the Hawaiian island of Maui, you can not only enjoy the beautiful sand, surf and sun of the magnificent beaches of Maui, but you can do so while learning how to SUP under the guise of Maria Souza, a water sports master, and expert stand up paddle board instructor. Her stand up paddle surf school in Maui is an excellent location for stand up paddle board lessons. You can enjoy SUP paddle boarding at her primary school or at any of the other beaches her and her top Maui SUP paddle board coaches also teach the exceedingly popular water sport. Since Hawaii has so many stunning beaches with incredible vistas and surfing conditions, it’s easy to understand that growing SUP popularity is centered on the Hawaiian archipelago, particularly Maui. Stand-up paddle boarding is easy enough to understand. Its goal is for you to stand up and use a paddle to manipulate the gorgeous beach waters. You don’t necessarily need to try to ride a wave like you would a traditional surfboard, as the SUP boards are longer, wider, and made to make it easier to enjoy calmer waters while maneuvering through the surf. A SUP board is easily found to rent or buy at any of the locations on the islands that sell water sports equipment. It will average between 10-12 feet long and has padded decks, surfboard fins for stability and concave hulls. Its construction is made so beginners can feel more comfortable learning without needing the care (like waxing) of traditional surfboards. Stand-up paddle boarding is also easy to pick up, but learning the basics and proper water sports safety is paramount to enjoying the sport. There are always surf conditions and safety situations to be aware of. So stand-up paddle boarding lessons from an expert like Maria Souza or one of the best Maui SUP paddle board coaches is a smart move. 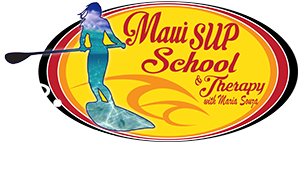 It’s no secret that the best place to paddle board in Maui is at Maria Souza’s SUP school. She’s got years of experience and certifications as an extreme water sports expert, specializing in stand-up paddle board surfing lessons. She teaches the top techniques and is a certified lifeguard and knows vast amounts of ocean knowledge, particularly the incredible beaches of Hawaii. The stand-up paddle boarding lessons taught by Maria and her team of highly skilled and trained coaches cover the theory as well as self-launching, self-rescue, posture, decision making, weather and beach knowledge, and etiquette. Her coaches emphasize safety above all us. This way you’ll have more fun with the knowledge that you’ll be able to do so safely. The school offers basic lessons for beginners and also has options that combine SUP and yoga, massage therapy, private lessons, Zen and personal growth and advanced SUP training for those wishing to take their learning to the next level with cross training, and SUP racing. When you decide to vacation in Maui or the Hawaiian islands, consider contacting us as we can add a new level of fun and excitement to your village. Feel free to get in touch with us via our contact information on this web page on our website at www.standuppaddlesurfschool.com. There you will find all the information you need to learn about what we offer with SUP paddle boarding and the services we provide. We guarantee to help you get the most of your Maui vacation and enjoy the surf, sun, and sand.